The bandwagon of new country rolled into Birmingham this evening as The Band Perry made the second city their first stop on the UK leg of the Pioneer World Tour. An enthusiastic and committed crowd gave the Alabama raised sibling trio a warm reception with Kimberly endearing the locals by perfecting the art of hometown pronunciation. Mutual love was certainly on the menu as an action packed eighty minute set confirmed the reputation of The Band Perry as being one of the hottest live acts surfacing out of the Nashville majors. The fast paced evolution of modern country music always has the potential to exasperate the chasm that has always existed within different strands of the genre. 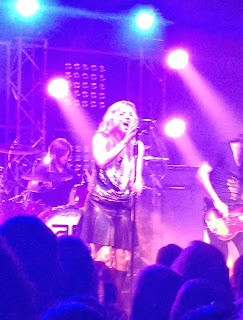 The Band Perry have anchored their style securely to the radio friendly and arena fraternity but have an underpinning substance to broaden their appeal and reach out to those who prefer the package a little less gift wrapped. While the stage presence and song delivery from their two studio albums to date rotated between unabated brashness and genuine heartfelt sincerity, the slick yet high octane performance brought the material to life in a way that met the full approval of this mixed aged audience. The evening was not short of pop/rock overtures as the trio backed by a four piece touring band opened their set with ‘Done’ from the latest album and closing the two-song encore just over an hour and a quarter later with a rip roaring cover of Queen’s ‘Fat Bottomed Girls'. From a personal point of view the gig got into the groove from the second track ‘Night Gone Wasted’ and from then on Kimberly orchestrated the moods from the lower key ‘All Your Life’, concluded with a sampling of ‘I Will Always Love You’, to the rousing ‘I am a Keeper’ and its lively follow on track ‘Forever Mine Never Mind’. The segment of the show where Kimberly and her brothers, Neil and Reid, shared the roots of their act with the audience went a long way to defining the important role The Band Perry have to play in driving a new generation. The trio of ‘Pioneer’, ‘Amazing Grace’ and ‘End of Times’ couldn’t help but captivate those present at this well attended gig which hopefully demonstrated to promoters that more mainstream touring country artists should add Birmingham to their UK itineraries. As well as sharing the pride of their musical Alabama upbringing, the siblings also acknowledged the influence previous UK audiences had in the ultimate naming of their sophomore album PIONEER which has proceeded to be a very successful venture for The Band Perry. As impressive as this heart rendering trio of songs was, the current pivotal sound of the band is to step up the pace and there was no finer example of this during the evening than the current US radio smash ‘Don’t Let Me Be Lonely’ which in my opinion serves as a perfect example of their mass appeal. Just prior to the encore we had a reminder of the excellent writing talents of Brandy Clark who had a prominent role in the composing of the popular ‘Better Dig Two’. However for many of the crowd, the anticipated highlight came soon after the band returned to the stage and Kimberly didn’t need to extend the invitation for some vocal assistance to ‘If I Die Young’. At this point of the evening there was an increasingly sad realisation that a personal favourite ‘Independence’ wasn’t going to make the set cut. 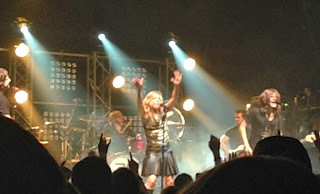 Despite this irritating omission, the evening was a resounding success and The Band Perry are living the dream of being an influential act capturing the moment and spearheading a fruitful path for the cross mass appeal sector of the country music genre. As long as artists like The Band Perry are the leading lights of new country then evolution need not be viewed too negatively and the spirit in the title of the PIONEER album can continue to set the agenda.